Keep the vase filled (or floral foam soaked) with water containing a flower food provided by your florist. Flower foods provide sugars, balance ph and limit bacterial growth. It is important to follow the mixing directions on the food packet. Most packets are to be mixed with either a pint or a quart of water. Do not dilute with more water than is specified on the packet. Check your arrangement daily to make sure it has plenty of clear fresh water. 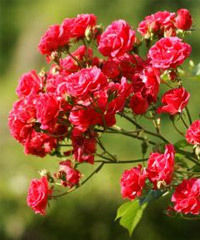 If possible, re-cut stems by removing one to two inches with a sharp knife or scissors that will not crush the stems. Immediately place the stems into warm solution or deeply and firmly back into floral foam. Keep flowers in a cool spot (65 to 72 degrees Fahrenheit), away from direct sunlight, heating or cooling vents, directly under ceiling fans, or near appliances. Heat from appliances or hot and cold drafts cause flowers to dehydrate. Keep your flowers in a cool place until you can get them in a flower food solution. Don't forget how important it is to follow the mixing directions on the flower food packet. Fill a clean (washed with a detergent or antibacterial cleaning solution), deep vase with water and add a flower food from your florist. Remove leaves that will be below the waterline to deter bacterial microbial growth that will limit water uptake by the flower. Re-cut stems by removing one to two inches with a sharp knife or scissors. Place the flowers in the vase solution you've prepared. If you purchase loose flowers for your own arrangements you should also consider these tips: When selecting flowers, look for flowers with upright, firm petals and buds beginning to open. Yellow, spotted or drooping leaves are signs of age. When using woody stems and branches (such as quince, forsythia or lilac), cut the stem with sharp pruning shears. 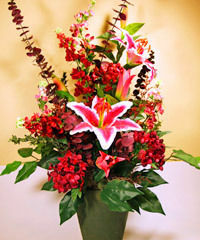 Place them in warm water containing fresh flower food to promote flower opening. Each cut flower variety has a different life expectancy. When buying flowers, be sure to ask your florist how long you should expect your arrangement to last. Whatever variety you choose, a little TLC will go a long way to keep your blooms looking fresh longer. Here are a few handy tips that can help add days to their beauty! Floral food is a combination of additives that help to nourish the flowers and discourage bacteria from growing in the water. It is one of the best -- and easiest -- ways to extend the life of your flowers. It is very important to follow the directions on the package correctly. Improperly mixed floral food can do more harm than good. Keep the floral foam soaked in water. The floral food added at the time of design by your florist will stay active. According to the National Animal Poison Control Center, certain types of lilies can cause renal failure in cats that have ingested any part of the lily. We strongly suggest keeping lilies out of the reach of cats. For more information, contact your veterinarian or the Animal Poison Control Center (APCC) at www.aspca.org/apcc or call 888-426-4435. It is important to note that lilies do not pose a problem for other pets or humans.